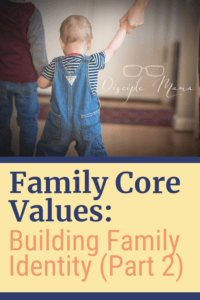 What are family core values? If you’re serious about discipleship parenting, you’ve probably put a lot of thought into defining your family values. Discipleship parenting means being intentional about passing our values on to our children. You can’t be intentional about passing values on to your kids unless you’ve decided what they are. So, carefully implementing family traditions that support our family values makes sense, right? And, it also makes sense to evaluate our traditions to figure out what they are connecting us (and our kids) to. If it’s not something that matches up with our values, it might make sense to cut those ties, or shift the tradition to be compatible with our beliefs and priorities. 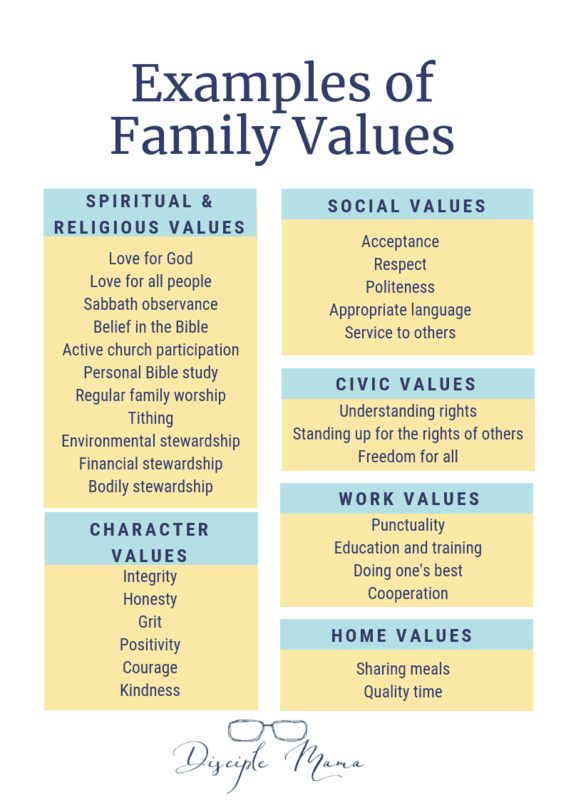 The following list of family values is not exhaustive, and you may think of other categories you’d like to add. Just make a list of your family’s values and refer back to it from time to time–with your spouse when your kids are young–and as a group when they get a bit older. Just be intentional about supporting your values with your family traditions and your family rules, too! 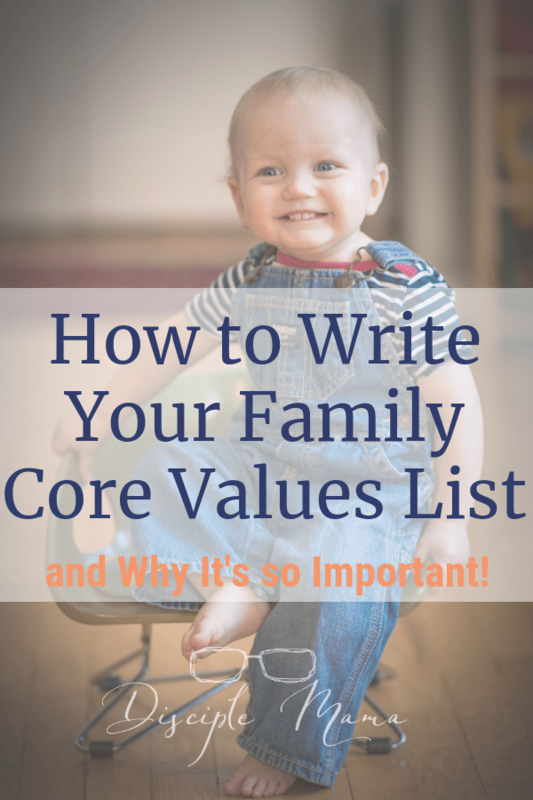 Why should I make a list of my family’s core values? Although 70% of parents claim to have a very specific set of family values, fewer than 30% have gone through the process of writing it out. (Source) That’s a pretty serious disconnect, and I have to admit: until recently, my husband and I hadn’t written out our family values, either. I know that a list of family values isn’t exactly the same as a list of goals, but the same basic principles apply: if you want to remember, focus on, and adhere to your list of values, you should write them down . And seriously, it doesn’t get much more important than your list of family core values. How do I make family core values list? List out all of your family values. 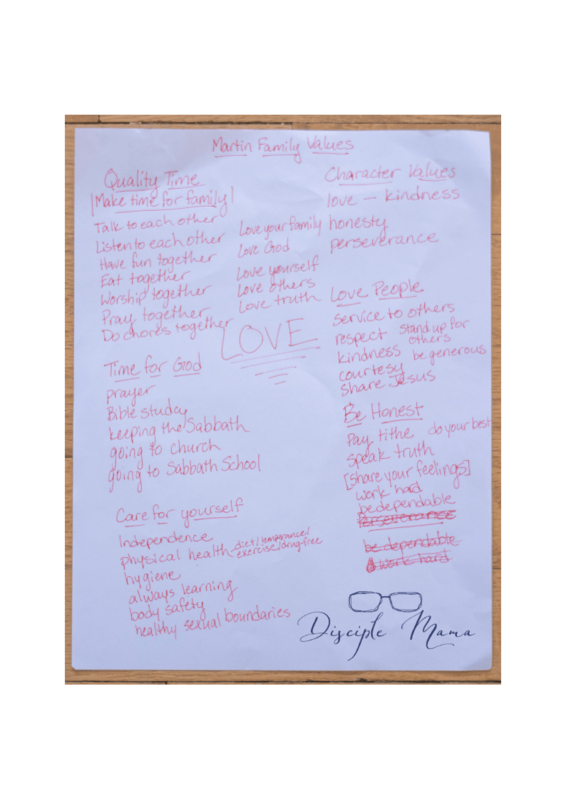 Using the (limited) examples from my list above, work with your spouse and older kids to make a list of your family’s values. It will probably be long, which means it probably won’t be too useful on a practical level…and that’s okay! Narrow your family values list down. The resulting big ideas will be a great framework for building all your family values on. My husband and I sat down and went through the process outlined on this infographic by Thalia over at Sacraparental.com. Thanks, Thalia! Start talking about your values, and acknowledge when they are demonstrated. Once we completed the first two steps, it was natural to start working on steps 3-4. The best part? We have common language to address issues and frame corrective and celebratory statements to our kids! Disciple Dad (I can call him that, right?!) 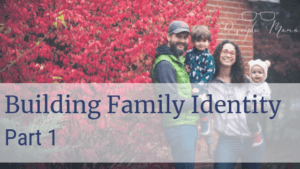 and I are a united front, and the kiddos are becoming familiar with our family core values as we go, simply because they’re hearing it from both of us in a variety of situations. Pay attention to values-related growth. Step 5 follows naturally, and it’s becoming easier for us to recognize and foster growth and improvements in our kids’ character development, because we’re actively looking for a specific set of values to be represented! We completed the list you see in the photo in one sitting, but thought of more to add and other little changes to make after the fact. We’ve tweaked our family list of core values until we’re happy with it, and now we’re working on designing a couple of versions of our list to put up in our boys’ rooms and also in a common area of our home. We’re also thinking about condensing the whole thing into a family mission statement. As it is right now, our 3 year old knows that in our home we love God, we love our family, we love others, we love ourselves, and we love truth. That’s the very simple, very condensed version of our family core values list, but we use each of those 5 categories as a little hook to hang our other, more specific values and behaviors on. Identify the values you are unintentionally passing on. This isn’t on the chart, but it’s important to think about the values you’re passing on to your kids without trying to teach them at all. In education, it’s called the “hidden curriculum” (source) and it can either support or contradict what you are trying to teach your kids (the formal curriculum). At home, just like at school, kids are learning constantly, and the whole “do as I say, not as I do” thing just doesn’t work. The way we live life is showing our kids where we actually place value, so acknowledging and addressing the disconnects between the how we’re living and what we say we value is essential. Maybe kindness is one of your core values, but you’re less than kind when someone isn’t driving the way you like on your morning commute. Maybe generosity is one of your core values, but you never have anything for the homeless person panhandling on the corner. Maybe honoring the Sabbath is a core value for your family, but not if it means missing the big game. Our kids know when what we say doesn’t line up with what we do, and they’re smart enough to know that actions mean more than words. Obviously we all make mistakes, and I’m not saying you should present a fake perfect life to your kids. I’m just saying that actions should reflect our values, and when we mess up, or when there’s a discrepancy between what we say is important and what we’re actually doing, parents need to acknowledge it, talk it over with their kids (in an age-appropriate manner), and either rethink the action or rethink that value’s place on the list. 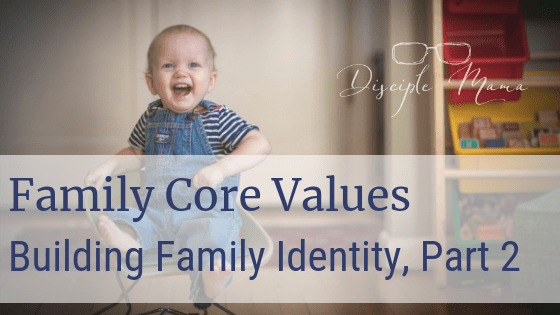 Making a family list of core values is worth the effort! This is a fantastic process to go through if for no other reason than to really talk to your spouse about what you are each wanting to focus on as you raise your little disciples. My husband and I were already pretty much on the same page (whew! ), probably because we’ve been working to be very intentional about all aspects of our parenting. We still have a long way to go, BUT, it was enlightening to have such a specific talk about values, and to work together to sort and categorize our values because it led to a depth of discussion that we’d never really had on the subject. We talked, listened, and learned from each other–and felt more united in this parenting gig than we had before. Try it! I truly think it’s going to add value to your family discussions, and it will really help bring focus to your discipleship parenting. 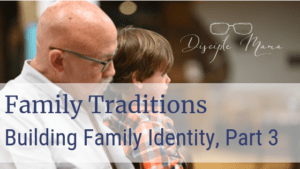 Not only that, but articulating these values will be so helpful when we tackle the next part of our Building Family Identity series: Family Traditions! Did you enjoy this post? Subscribe to the Disciple Mama newsletter so you don’t miss anything happening here! One of the core values we made with our daughter that she still has carried on for herself is always reading scripture at dinner. When I was a little girl, my grandmother would always have us read one of those scriptures from a box no matter who was at the table. Even if you couldn’t read someone read it for you. It was the way I learned so many scriptures before I could read and that became embedded within my heart. Wow, what a great family tradition! I love how intentional your grandmother was about teaching you to read scripture, and clearly her work paid off and you have instilled the same value in your daughter! Thank you for sharing, Sheila! I’ve loved seeing your family pictures on Instagram. This just shows to me even more all the intentionality you and your husband our in to raising disciples. In the short amount of time I’ve known you and your blog, I have looked up to you in so many ways for guidance and family support. THANK YOU! It’s so funny how we don’t always apply principles to different areas of our lives! Honestly it wasn’t until recently that I thought about doing this, myself, but when it DID come to mind, it just really made sense to me! So, I asked my husband if he was on board, and he was all in. We were writing down our values within 4 minutes of the first time we talked about the idea! Thank you so much for your kind words about my family! My husband and I mess up all the time, but we are both really very passionate about kids (especially our own) forming their own personal relationships with Jesus as early as possible! We have to be intentional, because there’s way too much other distracting stuff in the world to get our kids’ attention if we don’t introduce them to Jesus consistently and in a positive, engaging way. If we are at all inspirational, it’s because of the Spirit working through us, and it makes my blog worth the effort. The affirmation is so sweet to hear, thanks again, Jessie! What a great way for parents to focus their parenting on godly goals. Too late for me but I will pass this idea on. There’s definitely more than one way to pass godly values on to our kids, so I’m sure whatever you did was great! 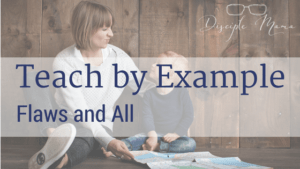 I think the key is to think it through so that you can be intentionally working toward, and (more importantly) praying for the outcomes you desire for your children. For the most part, I think parents are doing the best they know how to do, and I just want to pass on anything I learn along the way that makes good sense! Thank you so much for stopping by to read this post! Come again, Beth! This is a really great strategy! The steps you’ve outlined are clear, and the reasons you’ve given for writing down your values are compelling. I like this strategy so much, that I’m going to recommend it to others by posting your blog in a private Facebook group of mothers. Our children are all grown, but we followed a similar model. Did we do it perfectly? NO! I’m glad you addressed that, because we’re all sinners, meaning we’ll certainly mess up and not adhere to our own family values. Humility with our kids is so essential, for they see us mess up all our lives. Maybe that’s why, were I parenting and writing it all down today, I’d add humility as an essential core value. I’m so glad you enjoyed this post! Thank you so much for sharing it with other mothers, too! I would love to help anyone who might find this concept useful! Perfection just isn’t how we do parenting, is it? There has to be room for failures in any parenting strategy. It’s not really about IF we mess up, but how we handle it (and teach our kids to handle it) when we DO, right? I think that humility is a core value that should DEFINITELY be on my family list! It’s not something my husband and I have discussed, but I’m sure he’d agree. I’m glad that the list is more of a fluid document than a tablet of stone, so we can expand and adapt it as the kids learn and grow. Melinda, thank you so much for reading my blog today! I hope you’ll come back again soon! Great idea for setting core values for our family. I will share your ideas with my grown children for them to try. I agree it is so important to set values and write them down so everyone can see them all the time. Yvonne, I’m so glad you enjoyed this post, and thank you for sharing these ideas with your children! Please come and visit again soon! What a great idea to be intentional in discipling our family, writing it out instead of just “knowing it” in our head, and even that hidden teaching you mentioned. I love writing it out because journaling and writing Scripture to pray it has always helped me internalize truth. And I also love to insert my name and my husband and kids name into Scripture as an intentional method to pray over me and them in specific spiritual areas. I shared this on Twitter (and followed you) and Pinterest. What a great tool! I’m so glad you found value in this post, Karen! Writing things out really helps us to take them to heart, so I think we should do it with anything important that we’re working toward! Thank you so much for sharing my post. Please visit my blog again soon! This is such a good point. Sometimes we throw the words around like “core values” without actually stopping to think if we really know what they mean. Taking time to write them out will definitely prompt one to sit down and think and to actually evaluate their beliefs. Galina, yes! The process of thinking about and evaluating one’s values is almost more valuable than the actual list itself. Thanks so much for visiting my blog! I love this! I had never thought about writing them down. We generally have an idea of what our values and little expressions that we use, “The Best for Our Guest, and We Get the Rest.” However, writing them down would help us be more intentional. This will be a fun family activity and discussion during dinner tonight! Luisa, I think some people would probably do fine to define their core values in their minds and stick to them even without writing them down, but for most of us, putting it in writing really helps solidify our purposes! I hope you had a great dinner discussion about your family values! I’d be interested in hearing how it went, if you’re willing to share! 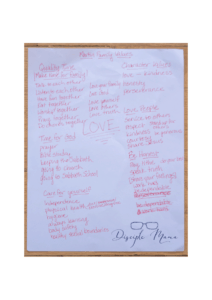 Marcie, it’s so great that you and your husband wrote out your values for your family! How wonderful! In some of my post-grad education classes we learned that best practice for teaching is teaching with the end in mind and it’s called “backward design.” If you know what your desired outcome is, it’s so much easier to craft the steps and processes you need to go through to reach the goal! Thank you so much for visiting my blog and for your comment! I have a son myself, so I read your post with interest. My husband and I have been lucky to agree to work on keeping our marriage healthy and talk about what’s going on in our lives. I enjoyed your list of family values and the way you’ve categories them – my favourite: Sharing meals. Edna, thank you so much for visiting my blog! I’m glad you enjoyed the post. It is such a blessing to have a healthy marriage and to be in unity with your spouse with regard to raising your children! Sharing family meals is such a treat, and I know many families don’t (or aren’t able to) do it these days. I’m planning to hang on to our shared meals for as long as I possibly can! Please come back and read more sometime soon! Our kids are grown now but we didn’t write out our core values. We took our children to church, showed them how to read and learn from the Bible and that it’s important to have a relationship and pray to the Lord. By leading by example and keeping the lines of communication open, the kids knew what was expected of them. Today, they’re awesome adults that we are so thankful for. Thanks for this idea. I think that teaching by example is absolutely the best way to pass on our values, Wendy! Whether or not you wrote down your core values, it sounds like you were very intentional in your parenting, and that it paid off, by the grace of God! There’s no surefire 100% foolproof plan for raising children to be disciples of Christ, but I do think that we have a responsibility to parent to the best of our ability and ask God to supply what we lack! Thank you so much for reading my post! Please come back soon. This was an excellent post! What a goldmine for Christian parents! Your ideas and strategies are not overwhelming, so anyone could give it a try and you make it clear how much more powerful this is than just hoping the kids absorb our values. Though my kids are older, I am planning to try this as soon as possible. It’s never too late to pass along our faith. God bless you! I know when I am looking for answers I don’t want anything too complicated (moms don’t have time for that! ), so I try to provide the same for others. It’s so easy to fall into the trap of “just hoping the kids absorb our values,” like you said, and that’s just not ideal for Christian parents to do. We have such an awesome responsibility to train and equip our kids for the Kingdom, and intentionality is vital for discipleship parenting! Melissa, thank you so much for reading! Please come again! Great post – 1984 when I became a Christian was a great time of personal development for me in many ways. I remember writing a list of everything I wanted “To Be – To Do and To Have” I’ve realised over the years that the “To Be” part creates the rest. Hi Bob, thanks for reading my post and for the kind words about it! You’re right, when we decide what we want to be (identity) we are in such a better position to work out how to get to that point! Intentionality is key. I hope you visit again! Never thought of this, love it! I have long believed that being intentional is by far the most important part of Christian parenting. Taking intentionality to the next step and writing it down is genius. Pinning this! Susan, I’m so glad you found this post helpful! Thank you so much for reading and for pinning it, too! Come back and visit my blog anytime! Rose, thanks for visiting my site! You should try it! I know it’s really helped us zero in on our core values, and I think any family could benefit from going through this process. I’m all for intentionality. I want to live my life intentionally, not just letting it float by. Thanks for encouraging us to think through our values and what we want to pass along. Thank you for your affirmation, Lisa! I’m glad you visited my blog today. Please come again soon!